Eighty-two-year-old Etta has never seen the ocean. So early one morning she takes a rifle, some chocolate, and her best boots, and begins walking the 3,232 kilometers from rural Canada eastward to the coast. Her husband Otto wakes to a note left on the kitchen table. I will try to remember to come back, Etta writes to him. Otto has seen the ocean, having crossed the Atlantic years ago to fight in a far-away war. He understands. But with Etta gone, the memories come crowding in and Otto struggles to keep them at bay. Russell has spent his whole life trying to keep up with Otto and loving Etta from afar. Russell insists on finding Etta, wherever she’s gone. Leaving his own farm will be the first act of defiance in his life. As Etta walks further toward the ocean, accompanied by a coyote named James, the lines among memory, illusion, and reality blur. Rocking back and forth with the pull of the waves, Etta and Otto and Russell and James moves from the hot and dry present of a quiet Canadian farm to a dusty burnt past of hunger, war, passion, and hope; from trying to remember to trying to forget; and inspires each of its characters to visit the sites they’ve longed to see and say the things they’ve longed to say. This is dazzling literary fiction about the rediscovery and care of the soul, and the idea it’s never too late for a great adventure. 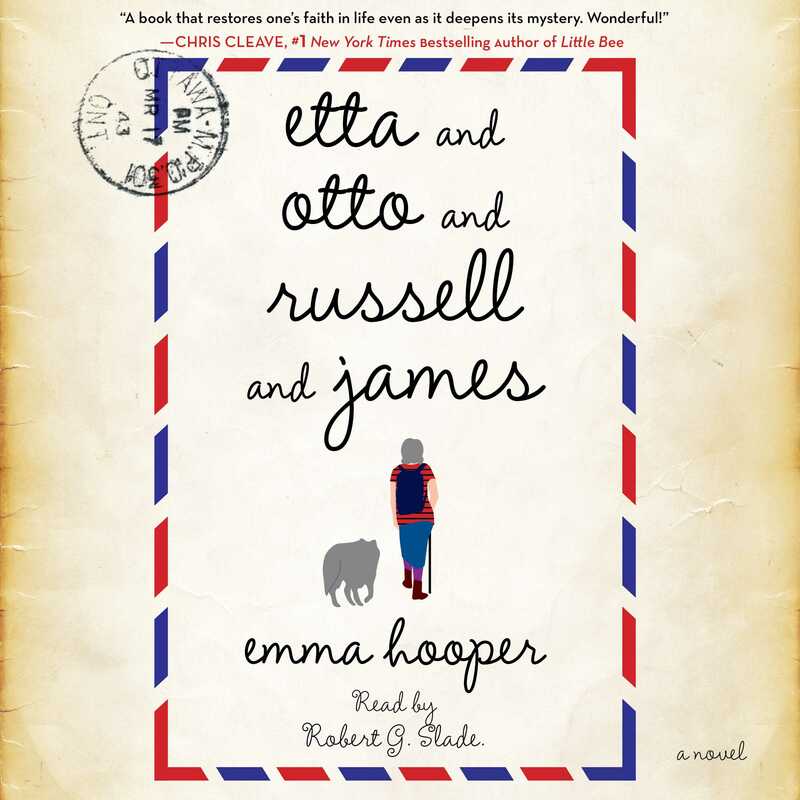 This reading group guide for Etta and Otto and Russell and James includes an introduction, discussion questions, ideas for enhancing your book club, and a Q&A with author Emma Hooper. The suggested questions are intended to help your reading group find new and interesting angles and topics for your discussion. We hope that these ideas will enrich your conversation and increase your enjoyment of the book. Otto Vogel wakes before dawn on his farm in rural Saskatchewan, Canada, to find a letter from his wife, Etta. She will return if she can; she has never seen water and has gone to find the ocean. When their beloved neighbor Russell Palmer learns from Otto that she has left, he embarks on a mission to find her. Her husband chooses to stay home. The two men had formed a deep bond as boys after an accident on a tractor left Russell partially crippled. Thereafter they alternated days at the schoolhouse, which was run by a young teacher, Etta Gloria Kinnick. Then World War II came, when Otto and every other young man in town (except Russell, because of his disability) was called to serve. As time passed, Etta read of Otto’s experiences in the war during a tender correspondence between them, which blossomed into romance when the young man returned on leave. Russell supported Etta emotionally when she suffered a devastating loss, but Etta chose Otto, not Russell, as her husband. Thereafter the three shared a warm friendship into their latter years. Now eighty-three-year-old Etta makes her way on foot toward Halifax in the east, taking on as a companion a somewhat tame coyote, whom she names James; her friend Russell, hoping to dissuade her from her mission, tracks her down, but she refuses to turn back and goes on undeterred. Otto, who knows in his heart that Etta must do as her own heart dictates, diverts his unease and sadness by taking up the craft of papier-mâché, at which he excels; and the two men await the outcome of Etta’s quest. 1. One day during their childhood years, Alma impressed her little sister Etta with a display of whitened fish bones, which Etta found strikingly beautiful: “What language do fish speak?” she asked. “Probably French,” said Alma. “Like Grandma.” Does the scene contain a clue to Etta’s late-life journey? 2. During the journey, James the coyote begins to speak to Etta in human language; a little boy who has seen Etta says she was “maybe a witch or maybe a lady-Santa-Claus. She was magical.” We are in a world of magic realism. What other subtle magic do you see in the novel? What role do you think this stylistic choice plays in the narrative? 3. Otto and Russell first learn about the war abroad through radio interviews, in which they hear a story about imprisoned children and babies who float through the prison window because they are so light from malnourishment. Discuss the meaning of this story. Where else in the novel do you come across storytelling or oral history? 4. Etta and Otto have long corresponded by letter, beginning with Otto’s letter from the European front and continuing much later while Etta is hiking to the ocean. In what ways do letters at the beginning and the end of their relationship mirror one another? Why do you think Emma Hooper chose the epistolary form to convey many of the details in her novel? 5. When Russell finds Etta and tries to convince her to come home, she responds: “You’re not actually here to fetch me. . . . You’re here . . . because it’s your turn, finally. It’s sad that you felt you needed my permission for that, but, oh well. Go, Russell, go do whatever, wherever. Go do it alone, and now, because you want to and you’re allowed to and you can.” What has Etta learned on her trek that prompts her to encourage Russell to travel? What meaning do you think Russell is seeking when he rides north in search of caribou? 6. In the course of Etta’s travels, she becomes a celebrity—as does Otto, at home, though both would rather have pursued their endeavors privately. What qualities do Etta’s pilgrimage to the sea and Otto’s papier-mâché projects share? What qualities distinguish them? What might these august achievements say about the nature of celebrity? 7. Russell does not return to his farm before the end of the novel, but in the latter part of the novel he sends a letter to Otto estimating that he “should be home” before autumn; then, still later, he is shown soliciting directions to the airport. How might his travels in the Northwest Territories have changed him? 8. In one of his letters, Otto admits to Etta that he has “this idea that all these boys who have come to fill the places of the ones we’ve lost will fill their places exactly and be shot through or stabbed in the dark or blown up just like the last ones, exactly like them, one to one.” His vision betrays disillusionment in the face of unremitting death on the battlefield. Do you think this is the author’s statement about the nature of war? How have wars affected you or those close to you? 9. As Etta’s journey gains national media attention, a journalist named Bryony decides unexpectedly to travel alongside her. Do you think Bryony’s account of her brother’s troubled life helps to explain that decision? Compare the loss of Bryony’s brother to Etta’s loss of her sister Alma. 10. At home, when husband and wife slept in the same bed, Etta tried to “sleep without any part of her touching any part of [Otto],” so that she would no longer be pulled into his dream. What was the dream? And while she lies in a hospital bed late in her journey, for a while her husband’s identity replaces her own. How do you interpret this phenomenon? 11. In the final pages, Etta enters the ocean at last. At home in his bed, Otto breathes “easy and deep six times in a slow ritardando,” and then he is “underwater.” How do you interpret the lovers’ meeting underwater, and their tender words as they sit there together? Why dos the author return to the past in the final lines of the novel? 1. Etta’s list of items she brings with her gives the reader a sense of what she values in her life. Create your own list of necessities as if you were embarking on a personal journey, and compare what your own list against the lists of others. 2. Write out a travel itinerary for a particular site you hope to see in your lifetime. How far would you be willing to travel on foot to reach your destination? How would leaving home abruptly, as Etta did, affect your friends and family? 3. Emma Hooper performs as a solo artist under the name Waitress for the Bees. Explore her music on the internet at http://waitressforthebees.bandcamp.com/ and compare the style and imagery to that of Etta and Otto and Russell and James. You wrote the novel using three different points of view and alternating narrative timelines. What challenges or rewards did this intricate structure give you as you worked? They say “A change is as good as a rest,” and I found this to be immensely true while writing this book; being able to swap between times and voices ensured that whenever I hit a wall with a certain person or plot, instead of having to quit for the day and go for a run or a bowl of cereal, I could switch perspectives or timeframes for a renewed sense of energy and excitement. The hope was that it would work the same way for readers. The reader suspects that when Etta pulls out a piece of paper annotated with her name and the names of her family members, she is slowly losing her memory. Yet Etta is haunted by dreams of her husband’s suffering in a war that occurred half a century ago. How did you balance the roles of memory and forgetfulness in a novel with an aging protagonist? One of the things that is most striking to me about memory loss, is how sufferers often lose the present, the short-term, while staying firm and clear in the long-term, the distant past. I wanted to explore this idea one step further, with Etta losing her own memories, and with them her sense of self, and soaking up Otto’s instead, particularly those distant, long-term memories of war and water. This is ultimately what spurs her to undertake the journey for herself, to rewrite the history she’s remembering on her own terms. You grew up in Alberta, relatively close to the fictional home of Etta, Otto, and Russell. How did the geography of Canada inspire your writing? Did you draw from personal experience when mapping out travel in the novel? My mother’s family is from rural Saskatchewan (to be honest, most of Saskatchewan is rural), and I spent many, many childhood vacations there, out walking in the wheat and sun (and mosquitoes). It’s a landscape unlike any other I have encountered, with a dry emptiness that is so vast and striking. Even though it’s not where I spent most of my time growing up, when I’m nostalgic for home it’s for these sorts of open spaces, that kind of dry air. You tightly intertwine the lives of Etta, Otto, and Russell from childhood, but James shares a relationship only with Etta. At what point did you realize that a talking coyote would be Etta’s guide during her journey? I tend not to plan ahead very much in my writing, so I found out about James at just about the same time as Etta did; I like letting my imagination take over in a sort of cruise-control in that way, asking myself as I write, “So, what happens now?” . . “Oh, she meets a coyote.”. . . “And then?” . . . “He licks her feet.” . . . “And then?” . . . “He talks.” . . . “And then?” etc. Writing a novel for me is just really asking “And then?” over and over again and trying not to question or doubt my own crazy answers. Folklore and magic realism feature prominently in the novel. How do you think these traditions have influenced you as a writer? What authors have inspired you most? My imagination runs away with me a fair amount in “normal” life . . . The other day I saw some metal piping hanging from a window and I thought: those look like robot arms . . . like robot arms hung like carcasses at a butcher’s . . . like we eat robots like we do animals . . . hmm . . . and then I’m off, imagining what that world would be like, getting to invent and, at least temporarily, inhabit it. A whole other world! It’s very exciting. I love the idea that you can imagine anything, anything you want and then work backwards to make it work within a comprehensible universe. I also had a moment recently where I saw some garbage bags by the side of the road that looked like sea lions. I knew they weren’t, actually, but it got me imagining a world where we’d put sea lions out at the side of the road every week. Why? Why not? This is one of my very favorite parts of being a writer. I’ve been inspired by many authors in many different ways. Reading Dave Eggers in university opened my eyes to the idea that narrative form could be playful and nonlinear, and that comedy and tragedy could work off each other within the same work. Marquez made the magical mundane in a really beautiful way, while Borges was the first to show me how prose could reflect on itself in structural spirals. Right now I’m very fond of Karen Russell and the half-real half-imagined universes her writing occupies. How would you best describe your process? Do you keep a single space dedicated to writing, or do you move around? What time of day do you find yourself most productive? I try to have a dedicated space. I have a great little loft with a lovely old desk and a rug with owls on it and a handmade-by-a-child pencil jar; however, I almost never use it. I do a lot of my best writing in little bits and pieces between other things. On trains to London or in scrappy notebooks in the middle of walks, or in dim, sticky bars during band sound checks. When I do work at home, it’s most often on the floor. I really like curling up on rugs with my laptop for some reason. Maybe because I had cats as a kid? I do, also, like café writing. There was a period of time when every week, my friend Simon and I would agree to meet at a new, different café in Bath, and sit at different tables and not speak to each other. The idea was that the peer pressure of having the other person there writing/working would spur us on. And it worked (for me at least). We would agree on a stop-time, and, once that rolled around, we’d quit working, go sit at the same table, and allow ourselves to socialize a bit. At this point we’d also give that particular café ratings according to things like level of noise, tastiness of hot chocolate (which is what I usually ordered), availability of gluten-free snacks (which is what Simon usually ordered), etc. We put it all into a giant spreadsheet we still have somewhere. . . . . It’s worth noting that this is something I kept up when I moved to London for a year and was working on the book’s edits. In this case it was my friend Jason I’d meet, fortnightly, and we’d share one silent table instead of two (London cafés are more crowded), but the overall formula was the same. And we’ve got a spreadsheet of café ratings for London too. Otto’s descriptions of war focus more on emotion than the details of combat, and censored fragments of letters and dreamscapes in the novel make his experiences impressionistic. These qualities lend your war scenes a sense of universality. What message about war in general beyond the conflicts of the World War II do you want your readers to take with them? My hope was, and is, that the impressionistic nature of the scenes would blur any definite details, so there are no concrete things to hold onto like “good guys” or “bad guys” or clear-cut right and wrong. People talk of “the fog of war”; I was hoping to depict something along those lines, “the blur of war,” where there are no certainties, no easy-to-pin-down exact signifiers, more visceral than academic, like wordless, instrumental music, or like Otto’s letters with all dates and people and places, all distinct references, removed. You are an accomplished musician and educator who wears a lot of hats. How has your formal training in music influenced your writing? How has your prose influenced your songwriting? Rhythm is a big part of my writing. I’ll often go back and change phrases because they have too many or not enough syllables, or the emphasis falls in the wrong place, regardless of the actual meaning of the words. The rhythm of prose can pull you in and along, just like it can in music. This is something that people acknowledge in poetry, I think, but that gets less attention in prose. However, I think it’s equally important in the latter, maybe even more so, for me, since long chunks of writing need that rhythm to keep pulling you along and through, both as writer and reader. This explains, among other things, my love of repetition. Otto’s newfound hobby of papier-mâché is a unique development for his storyline. From where did the idea originate to incorporate this craft into his anticipation for Etta and Russell’s return? There are two answers to this question, the superficial and the slightly more deep. Superficially, papier-maché is fun and I love it. Who doesn’t like making and smashing piñatas? I won my grade 8 science fair by making a papier-maché dolphin to scale with all its organs in place . . . I think doing and making hands-on crafts is good for the head and the heart. On another level, a running theme in this book is the “swap” that Etta and Otto are undergoing, both in terms of the stereotypical gender roles of their generation, and also the roles they’ve played throughout their own specific lives. Etta does this by “doing” and “going,” and Otto by “creating” and “nurturing.” Hence the papier mache (and the baking, and the guinea pig too). Each character responds differently to Etta’s choice to walk halfway across the country, and she is received variously with humility, anger, hope, and sensationalist conjecture. What do you want readers to take away most from her bold decision? In the words of my Etta, I would love for them to “go do whatever, wherever. Go do it alone, and now, because you want to and you’re allowed to and you can.” This could mean writing a book or starting an astronomy degree or cutting their own hair or learning Mandarin or any other thing they’ve always wanted to do. 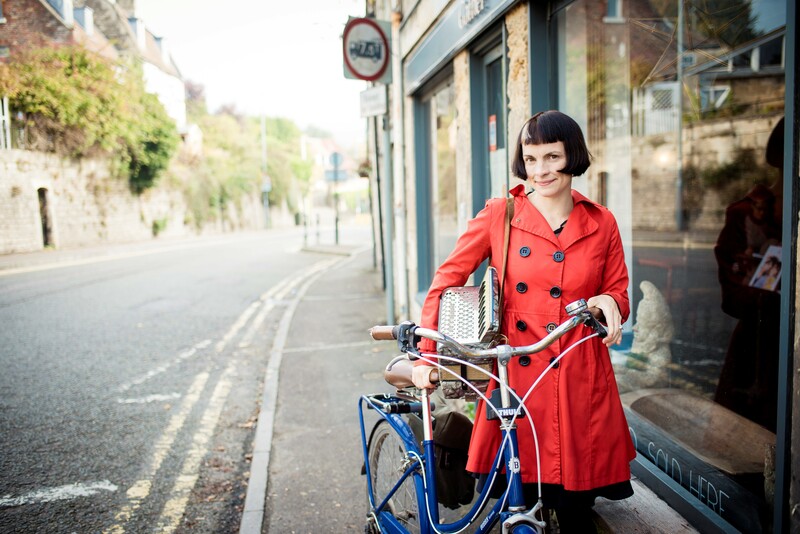 Raised in Alberta, Canada, Emma Hooper brought her love of music and literature to the UK, where she received a doctorate in Musico-Literary studies at the University of East-Anglia and currently lectures at Bath Spa University. A musician, Emma performs as the solo artist Waitress for the Bees and plays with a number of bands. She lives in Bath, UK, but goes home to Canada to cross-country ski whenever she can. She is the author of Etta and Otto and Russell and James and Our Homesick Songs.